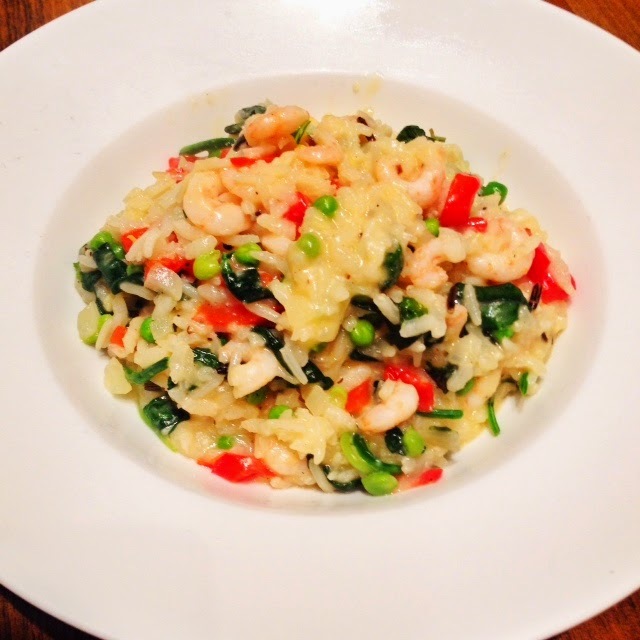 Prawn and Goats Cheese Risotto – 14sp! Goat’s cheese has a delicious flavour and lasts forever in the fridge so I usually buy some once every couple of months and use it when I am getting down to the last of the contents of my cupboards. Having been in this situation yesterday evening, and having no meat defrosted, I decided to try something new and give the combination of prawns and goats cheese a whirl. I had all the ingredients lurking about in the kitchen already so it was really easy to put together and I have to say, it tasted absolutely incredible. It’s a bit different from other risotto flavours I’ve tried before as a result of the gooey goats cheese and its definitely one I will be repeating again and again! If you aren’t a fan of seafood, this recipe would be equally as nice with bacon or even chorizo. Just remember to revise the sp accordingly. Pop your kettle on to boil and once done add 500ml boiling water to a pan. Set the pan simmering away and drop in your stock cube. Keep this simmering as you add the stock throughout the recipe to keep the cooking time down. To begin the risotto take a heavy based pan, add the olive oil and put on a medium heat. Add your onions and cook for around five minutes (until nice and translucent). Add the garlic and red pepper and fry for another few minutes, adding a little water if the pan gets to dry. Next add your rice, stir into the onions and cook for another minute. Then add your wine and simmer until the wine has all but soaked in. Then add around 200ml of the stock, simmer and keep stirring until soaked into the rice. Continue to add the chicken stock a ladleful at a time until the rice has cooked (about 25 minutes). You may not need all the stock, you can judge as you go along. Once the rice has cooked, add the prawns, goat’s cheese and peas, season well and cook for a few minutes until the prawns and peas have cooked through and the goats cheese has gone all gooey. Then add the basil and spinach, give a good stir, take off the heat and let the residual heat wilt the spinach. Then add the parmesan, grate in a little lemon zest, squeeze in the juice of half a small lemon and give a good stir. Serve in a nice big bowl with another slice of fresh lemon. Had this dish last night, a winner in the booker residence!! Was naughty & added 1/2 tsp of crushed chilli yum.